Pure honey is spun out of the comb, strained through a sieve to remove any remnant of wax or other particles and sealed raw in germ-free containers. We prefer to bottle our honey raw instead of heating and sealing it. Even though heating the honey would speed up our production process, heating also reduces the flavor and kills some of the enzymes that are beneficial to health. There's nothing better than one of Mom's yeast rolls fresh out of the oven with some honey drizzled on it. In addition to enjoying it fresh, our honey is also ideal for baking, for use as a sweetener for your hot drinks or for making wonderful meat glazes. 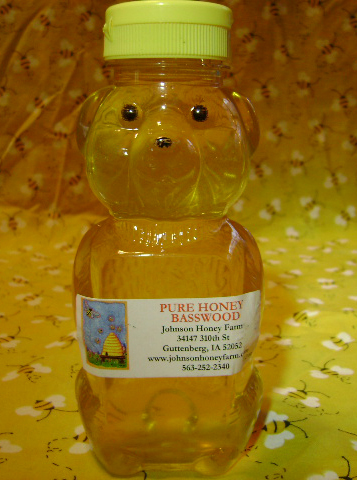 Basswood Honey is a lighter, milder tasting honey. Some people have described it as having a light minty finishing taste. This honey is harvested early in the year after the Linden (Basswood) trees are done flowering - that's how we know it has just the Basswood pollen in it. It can be used in your baking, in place of sugar and in your hot drinks - being a milder honey, the honey flavor doesn't come through as strongly as it does if you use Wildflower Honey.